B-lymphocyte. Coloured Scanning Electron Microgr- aph of a group of B-lymphocyte white blood cells. The cell surfaces are covered with tiny ridges and projections called microvilli, which help it bind to target proteins. B-cells account for 10% of the body's lymphocytes. 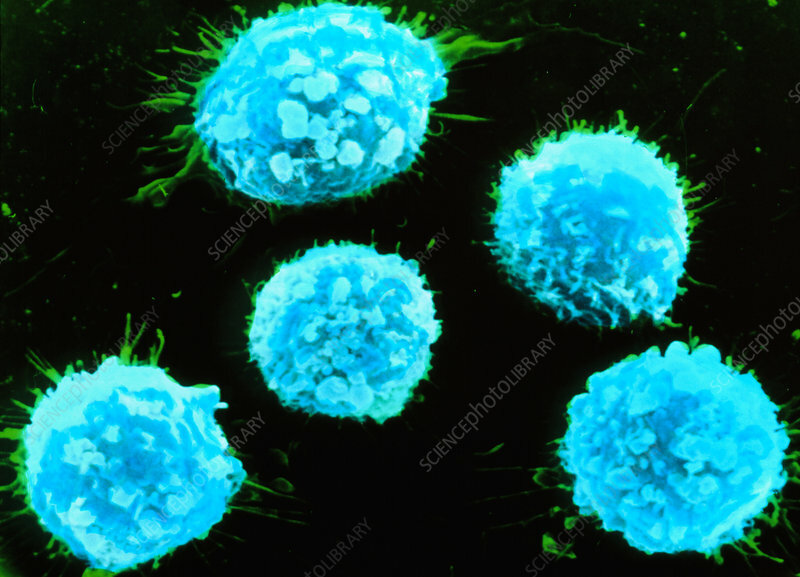 On encountering a foreign antigen, such as a bacterial surface protein, the immature B-cell either divides into a number of plasma cells, which produce antibodies that kill the invader, or it matures into a memory cell. Memory cells remain in the body for years, giving immunity to the original pathogen. Magnification x2000 at 6x7cm size.